www.EMFFix.com and www.TheBrainCan.com present a media library of presentations on EMF, EMF Reconciliation, EMF Filtration, EMF Meter and Measurement, Electromagnetic Frequency, and EMF Filters. We offer opportunities for customers to purchase these units, for people to secure an income helping others, or both. See the opportunity link at the bottom of the page. A Startling Look At The Effects Of Electropolution On Your Health. Edited and compiled by Bruce Fife, N.D. with the assistance of the Electric and Magnetic Fields Research and Public Information Dissemination Program and the National Institute of Environmental Health Sciences. We are under continual attack from electromagnetic fields (EMFs) radiating from power lines, household wiring, microwave ovens, computers, televisions, clock radios, cellular phones, electric blankets and other appliances. Researchers have correlated electropollution with increases in cancer, birth defects, depression, learning disabilities, Chronic Fatigue Syndrome, Alzheimer’s disease, and Sudden Infant Death Syndrome. The danger is real and with increasing use of electricity in our environment it is one of the reasons why many scientists believe some disease rates are on the rise. EMFs are not blocked or weakened by trees, walls, buildings, or other structures. Like X-rays they pass through these objects and into our bodies — disrupting normal cellular function and biological processes. For most of us our greatest exposure to EMFs comes from within our own homes. All household appliances emit EMFs. But you cannot tell which are most dangerous by their size or function. Often the small devices like electric can openers and hair dryers are much more dangerous than the larger ones such as electric ovens or refrigerators. Email contact preferred so that we adequately understand and respond to your questions. What are EMF (ELECTROMAGNETIC FREQUENCY FILTERS) Filters for? EMF (ELECTROMAGNETIC FREQUENCY FILTERS) Filters remove or reduce high-frequency pollutants from the electrical wiring in your home or business. How can I tell if I need EMF (ELECTROMAGNETIC FREQUENCY FILTERS) Filters? 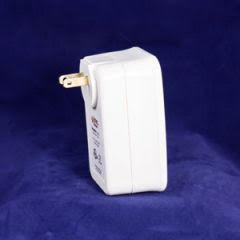 If you and your neighbors have electronic equipment connected to electric outlets you need EMF (ELECTROMAGNETIC FREQUENCY FILTERS) Filters. The EMF (ELECTROMAGNETIC FREQUENCY) Microsurge meter can be used as an aid in determining exactly how many filters you may need. How many EMF (ELECTROMAGNETIC FREQUENCY FILTERS) Filters do I need? It usually takes 20 filters to effectively “clean up” the average home. Homes with more electronic equipment (i.e. computers, printers, fax machines, televisions) may require more filters. View our filter installation instructions for more information. What is the lifespan of EMF (ELECTROMAGNETIC FREQUENCY FILTERS) Filters? EMF (ELECTROMAGNETIC FREQUENCY FILTERS) Filters are not like oil filters that fill up with use. They are an electronic component, and should last a lifetime. Do I need an electrician to install EMF (ELECTROMAGNETIC FREQUENCY FILTERS) Filters? No. EMF (ELECTROMAGNETIC FREQUENCY FILTERS) Filters are designed so that anyone can properly install them. Simply plug the filters into an electrical outlet or power strip. How do I install EMF (ELECTROMAGNETIC FREQUENCY FILTERS) Filters in my home? View our filter installation instructions document for more information. I plugged in a EMF (ELECTROMAGNETIC FREQUENCY FILTERS) Filter and there was a spark. Is this normal? Yes, it is normal for the filters to spark when being plugged in. This should not hurt you, your electronic equipment, or the filters. I plugged in a EMF (ELECTROMAGNETIC FREQUENCY FILTERS) Filter and it started humming. Should it do this? No. When an EMF (ELECTROMAGNETIC FREQUENCY FILTERS) Filter is humming, it is overloaded. To resolved this problem, simply plug in more filters. Remember, it takes an average of 20 filters to clean up a home. One or two filters cannot do the work of twenty. How can I tell if a EMF (ELECTROMAGNETIC FREQUENCY FILTERS) Filter is working? The only way to tell if a EMF (ELECTROMAGNETIC FREQUENCY FILTERS) Filter is working is with the use of an oscilloscope or specially designed meter. However, many people claim they can tell the filters are working because they start to feel better. 2 in. x 2 in. x 4 in.